I want to monitor the temperature one of my pucks. It is now installed in my freezer. Initially I wanted to do this monitoring from a RaspberryPi v3 running Jessie which is about 4m behind the freezer through a wall but I would prefer the temp to be broadcast via BLE so that this sensor is readable by tools such as gatttool on the RaspberryPi and other devices that support BLE eg my Android phone. Now that I know the radio transmission path is OK and the sensor is working the next challenge is to get this puck broadcasting the temp. To maximise battery life I don't want to connect to the puck each time I want a temperature reading; instead I would like to receive data over BLE like a beacon. 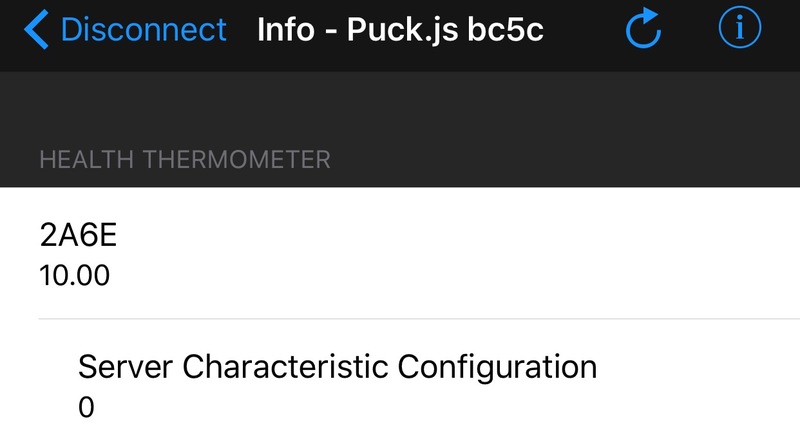 Has anyone cracked sensor readings from the puck using the BLE broadcast features? @MaBe, thanks for the code, looks interesting! However it does not work for me, I tried for example the nRFToolbox on an iPhone. That does not display the data. Can you tell which application you used to read the data? (directly from the tutorial). Then I can see the data directly in nRF Connect without even connecting. Okay, thanks, that works for me as well. At least on one Puck, on the other it does not work at all. @MaBe, many thanks for those examples. Really helpful. Worked second time of asking. Weirdly copy / pasting into nano and uploading via CLI on Raspberry resulted in the error below which seen before but luckily the example was easy to retype. Here is the error encounted after cut/pasting the code. Strange error - can you post an issue on https://github.com/espruino/EspruinoTool­s with the exact contents of the file that wouldn't upload? Tnx. Will create an issue for that error when I get home. Tell me who to write if I found a bug in the module? @Mark thanks - it's all updated now! I am reading temps using gatttool but because I have to connect to do this I suspect a purist would point out that this is not Low Energy yet. For that I plan to explore use of Node Red over the holiday but in the meantime, has anyone got broadcasts working? If so, what mobile app or tools are you using to view the advertising? Are you able to post a screenshot? I have tried broadcasting ('advertising') using example code from this thread and it works great. Note that the hub only publishes when the temp value has changed, or every 60 seconds. Anyone know of any useful Android or OSX apps/utilities that could be used to receive/view the puck notifications? If you mean notifications via MQTT on Android I use MyMQTT. For iOS there's and app called MQTT Tester that I haven't tried. If you mean notification directly from the puck via BLE there's nRF Connect for Android that works. For iOS it's called nRF Toolbox but I haven't tried it. My iPad is too old. For OSX I have no idea.